MGM Grand Hotel, Monte Carlo, Bellagio. Each considered iconic in the wide-world of casinos. However, we’re taking you to a whole new casino experience that’s anything but land-based. 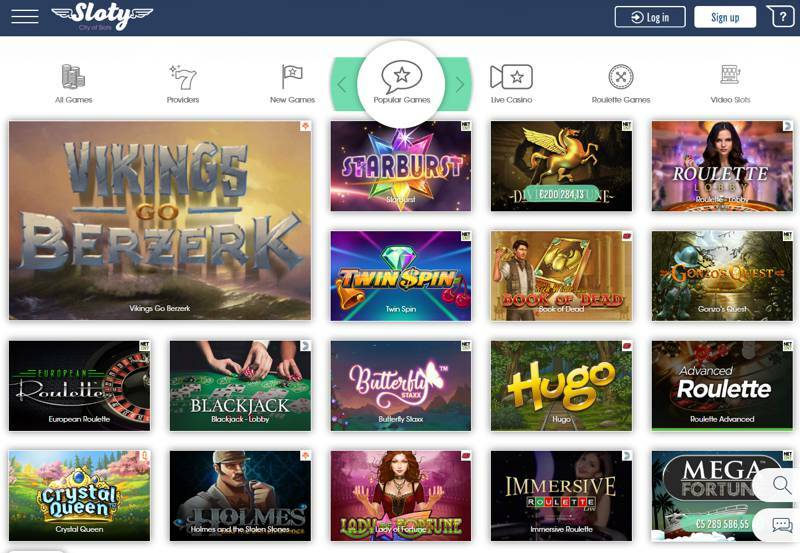 With an ever-ascending number of state-of-the-games, a soaringly-good mobile experience and a sky-rocketing suite of the very best bonuses, we’re whisking you above the clouds to Sloty – a sky-bound casino like no other. 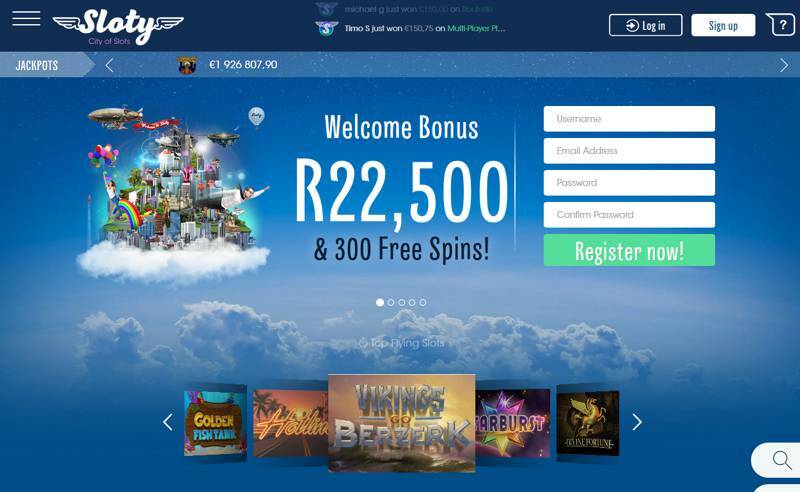 The first thing players will see as they touch down in the city of slots is an astounding Welcome Package comprising R22,500 & 300 Free Spins on their first four deposits! When depositing, players can hit ‘I want a bonus’ and select the Welcome Bonus from the dropdown to swoop up a 100% matched bonus up to R4,500 in addition to their 300 Free Spins, 30 of which will be made available on each of the ten days following their first deposit. Second deposit – 50% match deposit bonus of up to R6,000. Third and fourth deposit – 25% match deposit bonus of up to R6,000. The Sloty cloud isn’t just a receptacle for rainwater – It’s a container for over a thousand incredible games, most of which can be played on mobile devices, brought to them by some of the industry’s most ground-breaking providers! Evolution’s Dream Catcher will have players spinning with excitement – spin the money wheel, watch the colours cascade and guess where it’ll stop! As simple as it gets. And with an RTP of 96.58%, huge 40/1 payouts and a killer couple of Bonus Multiplier segments, this roving revelation is bound to get you into a spin! Those looking to place a little piece of Polynesian perfection into their play, go for NetEnt’s Aloha, loaded with awesome features such as Cluster Pays, Substitutions, a Symbol Drop feature game, Sticky Win Re-spins & a few classic Free Spins! And with a generous 96.42% RTP, we think this will have players heading for a little tiki-time again and again! Sloty makes it fast and simple to top up player accounts. Players can airdrop in as little as R300 and as much as R75,000 at any one time! Visa, Electron and Mastercard remain the most straightforward of payments methods with the likes of EasyEFT, ecoPayz, Skrill and Neteller also giving players options to deposit! Any deposits made via Credit/Debit Cards and E-Wallets are immediate too, meaning there are no delays in getting you to the slots! Withdrawing your cash is no different. And completely free! The maximum players can withdraw at any one time is R35,000 for all methods. Withdrawals to all methods, from ecoPayz, Skrill to Neteller clear instantly. The only exception is Bank Transfers which may take as long as five working days. Sloty knows its role and knows how to keep its passengers safe by offering a range of ways to keep their gaming habits sensible. By accessing the Responsible Gambling section at Sloty’s bottom-most navigation menu, players can view an array of info from Questionnaires, to Deposit Limits, Self-exclusion, Filtering Systems to even Underage Gaming. Beyond this, not satisfied with just giving you the minimum in detail, Sloty also provides hyperlinks to Gambling Support Groups such as GamCare, Gamblers Anonymous and Gambling Therapy to ensure players have guidance and therapy if they recognise their gaming, or that of a close friend or family member, has become a problem. Sloty possesses a crystal-clear FAQ menu about a range of potential account or games issues. Whether it’s to do with registration or even cybersecurity, Sloty has it all to take you under their wing. There is a complete and wide-ranging menu containing account-funding info as well as all the details a player could need about withdrawing too! That’s not the end of it either! Sloty delivers its players a total of three ways to communicate when FAQs don’t cut the mustard. Helpful Support Agents are never far away and can be reached via phone, email or Live Chat to give players whatever they need to log in and play safely, responsibly and most importantly happily! That’s about the size of it, so what next? With a fully-optimised, easy-to-use and spacious mobile environment, a breath-taking range of games, a simply superb Welcome Offer, straight-forward, no-fuss payment methods and a whole suite of ways to get in touch with their industry-leading Customer Support, we’d say there’s no cloud left unfluffed with this self-styled city of slots! They’ve covered every corner of the sky. All of these great features are complemented by a spacious, thoughtfully-designed and crisply-dynamic environment – We say, don’t wait! Take your first foray into some seriously blue-sky slots play. Do we sound a little animated? Good! Take a spin at Sloty, and you’ll see why!